This edition of Science Real-Talk is inspired by Bright Half Life's director Jessica Holt, who threw down some science at first rehearsal. 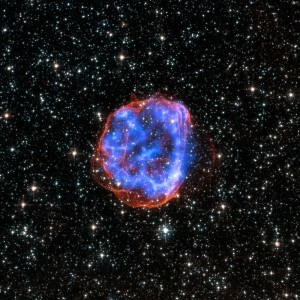 Knowing a little about half-lives and supernovae will help you understand the central metaphor of the play. The story of the play is the story of Vicky and Erica's half-life. Their love generates supernova-like energy and luminosity that could light a galaxy. Now that half life is clear, what is a supernova? A massive star exploded in the Large Magellanic Cloud, leaving behind an expanding shell of debris named SNR 0519-69.0 (Super Nova Remnant). Here, multi-million degree gas is seen in X-rays (blue). The outer edge of the explosion (red) and stars are seen in visible light from Hubble. A supernova is the explosion of a star that unleashes a massive burst of light through the cosmos. It is the largest explosion that takes place in space. Supernovas blaze so brightly that they can be seen at distances of up to 10 billion light years away. Light from these distant supernovas can tell us how the behavior of the universe has changed during the several billion years of the light’s journey to Earth. One type of supernova occurs at the end of a single star’s lifetime. As the star runs out of nuclear fuel, some of its mass flows into its core. Eventually, the core is so heavy that it cannot withstand its own gravitational force. The core collapses, which results in the giant explosion of a supernova. The sun is a single star, but it does not have enough mass to become a supernova. The second type of supernova happens in binary star systems. Binary stars are two stars that orbit the same point. One of the stars, a carbon-oxygen white dwarf, steals matter from its companion star. Eventually, the white dwarf accumulates too much matter. Having too much matter causes the star to explode, resulting in a supernova. Adapted from the Nasa Knows series, for middle schoolers. Yes, middle school science is the BEST!